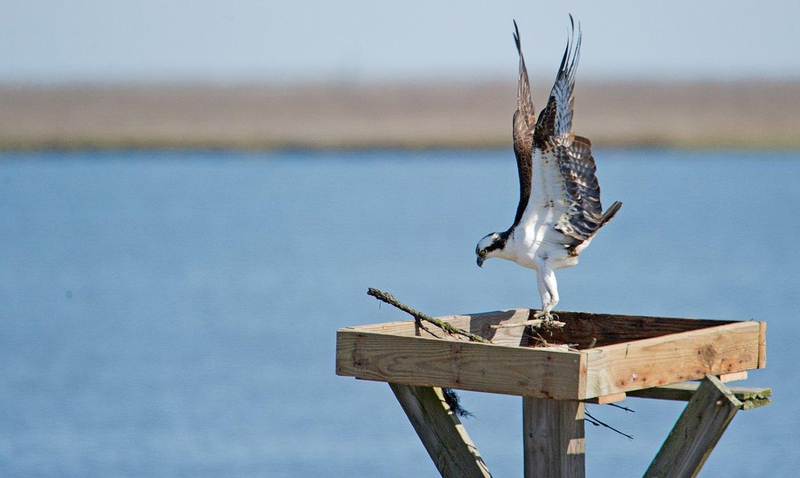 NJTV News recently covered the continuing recovery of ospreys in the Garden State by visiting the nesting pair at Long Beach Island Foundation for the Arts & Sciences. CWF’s Ben Wurst and David Wheeler joined NJTV for this inspiring video and accompanying story. 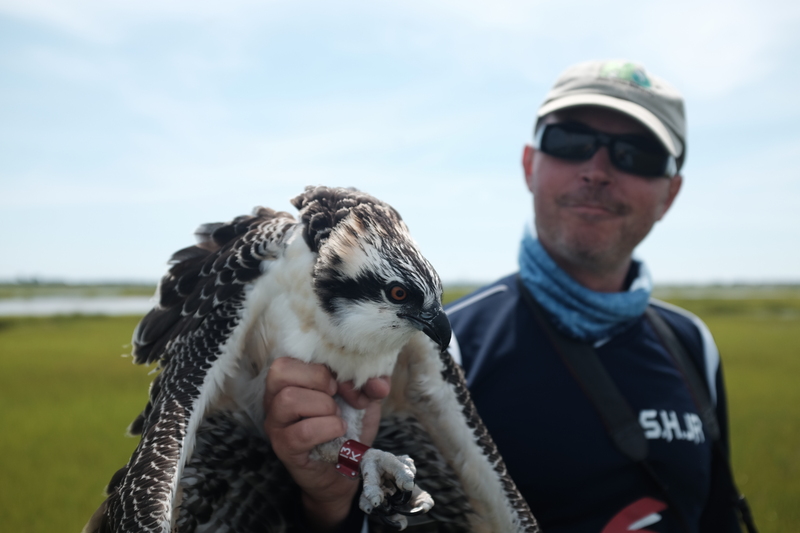 On July 6, I had the opportunity to participate in an osprey banding project with Larissa Smith (Wildlife Biologist/Volunteer Manager) and her husband Matt, who have been banding ospreys for many years. I was thrilled that Larissa invited me to tag along because I knew that it would be an amazing experience, but I had no idea it would be a day that I would never forget. I was expecting to get some good pictures and maybe even get to hold an osprey, but we came upon a situation that would make the day so much more rewarding. About half way through the day as Matt approached an osprey nest and got ready to climb up, he noticed a young osprey chick lying on the ground below the nest. It appeared weak and dehydrated, but uninjured. The nest above contained two older and larger chicks, and it became evident to us that the young runt was most likely pushed out of the nest by it’s competitive siblings. Our first thought was to put the chick back in the nest, however we knew that it would ultimately suffer the same fate, especially in it’s weakened condition. Our second thought was to take it to a rehabilitation facility, but since it did not appear to be injured we thought it would be best to keep it in the wild if possible. This brought us to our third option…find a foster home. We offered the chick some much needed water and carried it back to the boat. I had the pleasure of holding and comforting our chick on the boat ride as we searched for the perfect nest. We came upon an empty nest holding three eggs which never hatched. The parents were lingering nearby and still seemed interested in parenting. We decided to give it a try. I was really enjoying my time with the chick and quickly grew attached, but I knew we had to get it into the care of some adults as soon as possible. Reluctantly, I climbed the ladder and placed the chick into it’s new home and said goodbye. We got back in the boat and watched from a distance to observe how the adults reacted. One adult circled the nest many times observing from a distance. After several minutes it landed on the edge of the nest to get a closer look. I can just imagine the surprise and confusion it must have felt, but I was hoping that it was happy to see the little bundle of joy. After a few more minutes the partner joined in the nest, and we continued on with our banding to give them a little time to adjust. Before finishing for the day, we went back to check on the nest. We were relieved to see both foster parents in the nest, and already protecting their adopted chick by swooping at us as we got close. It seemed as though they had already accepted the chick as their own. Two days later Matt went back to the nest to check on the foster family. The chick looked stronger and had a full crop. This made it clear that the parents were feeding it since the crop was completely empty on the day we found it. About three weeks later, at the end of July, he checked on the nest once more and found our foster chick in good health and growing. I was so elated to hear the news and to know that our rescue mission was a success and this wonderful bird got a second chance at life. 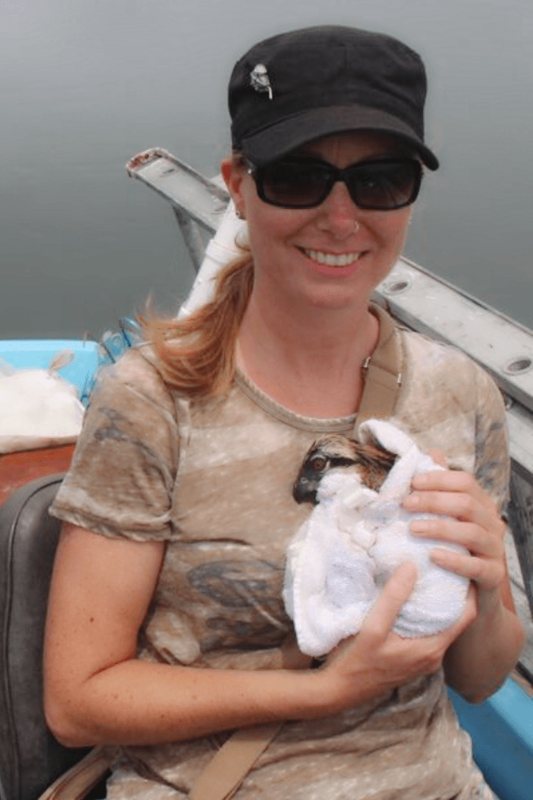 This experience was so rewarding for me because even though we had to intervene, we were able to let the natural instinct of the osprey take over to raise this abandoned chick in need. I now have an even greater respect for ospreys because they will care for young that are not their own. This is an important characteristic for a threatened species to have in order to keep the population growing. This particular chick experienced both the competitive instincts of it’s siblings fighting for survival, and also the protective instincts of it’s foster parents who put all of their energy into raising it. I feel so thankful to have been a part of this success story, and it reinforces all the reasons that I will continue to be a volunteer. Being able to make a difference even to just one individual is all the reward I need. Meghan Kolk is a Volunteer for the Conserve Wildlife Foundation of New Jersey. By now most ospreys are back from their wintering grounds in Central and northern South America. Generally the older more experienced birds return first and the younger inexperienced adults follow. Over the past month I’ve been very busy with platform repairs and installations throughout coastal New Jersey. You may not be aware but I maintain a huge number of nesting platforms. In just the past couple weeks I’ve worked as far south as Avalon (where I lead a group of students and their parents from Collingswood to replace an existing platform) and as far north as Bayonne (where I installed 3 platforms with local middle and high school students). Both were memorable experiences for both myself and many of the students. Most of them had never been on a boat or ever had the chance to walk on the saltmarsh. 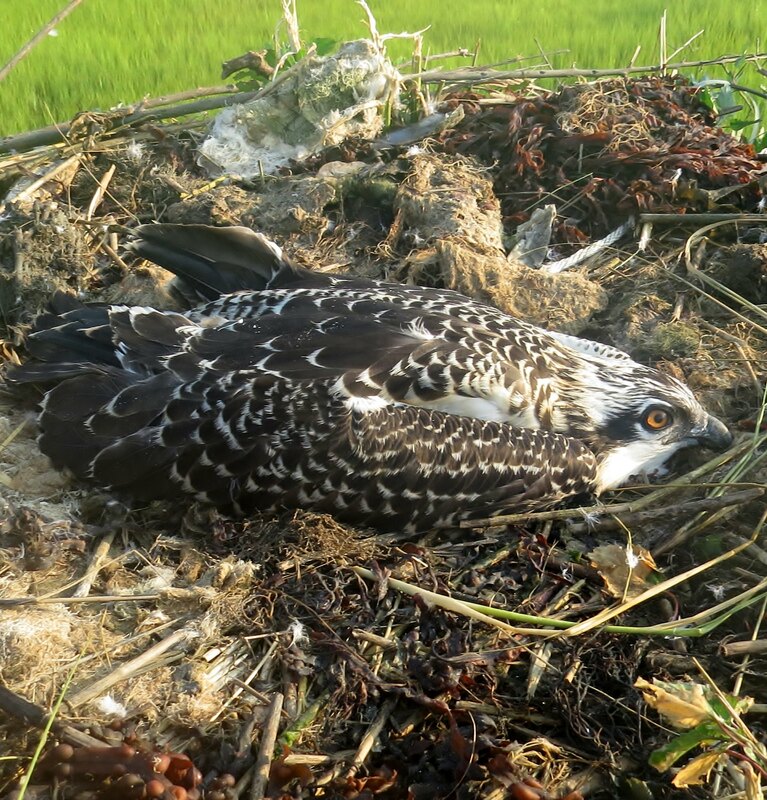 Maintenance of existing platforms is critical to the continued recovery of ospreys. 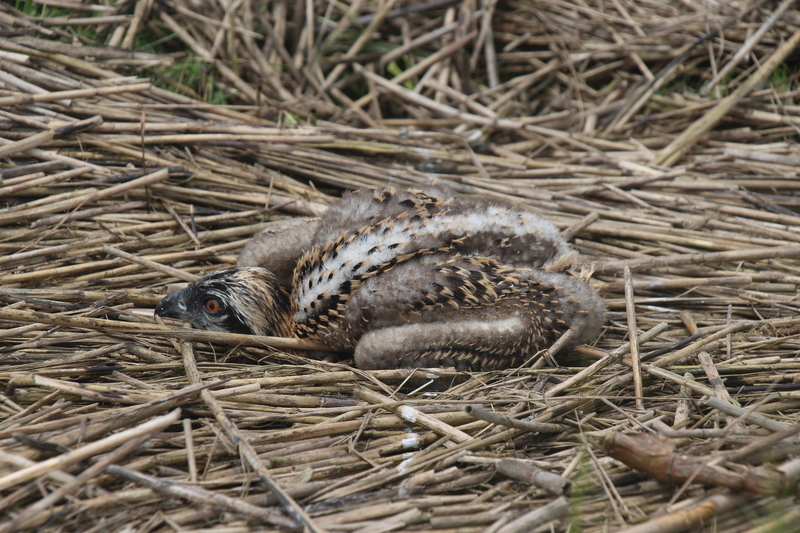 Over time (and in some cases, not much time) the condition of these nesting platforms is degraded, mainly by the environmental conditions where they’re placed. For the most part the fasteners are what go first from contact with high levels of moisture in the air, after that, the wood decays (unless a pressure treated or cedar wood is used). One way to help prevent the decay of platforms is to use marine grade stainless steel screws, galvanized bolts, and treated lumber. If we were to lose a large portion of the available nesting platforms in a given year then the population would suffer, so it’s important to make sure existing platforms remain in good condition. Last week I got out to the “Wildlife Drive” at Forsythe NWR in Oceanville to repair a platform. The platform top had lost a side and could no longer hold nesting material. I built a new top out of salvaged wood that I collect and installed it on Thursday afternoon. 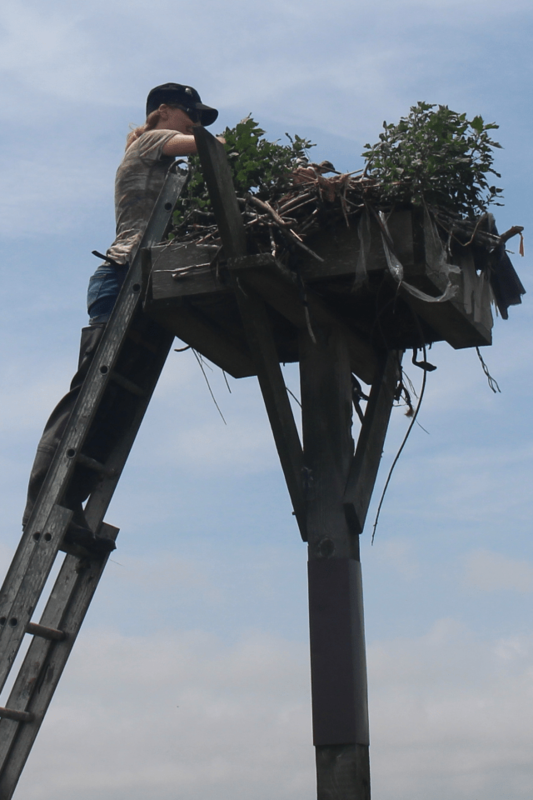 The next day a male osprey began to place nesting material in the freshly repaired platform. Talk about perfect timing!